C. Richard Dobson, CLU | Consolidated Planning, Inc.
Rick is a graduate of the University of North Carolina at Charlotte, where he was point guard & captain of the UNCC basketball team. He entered the Life Insurance business in 1975 and obtained his Chartered Life Underwriter designation in 1980. 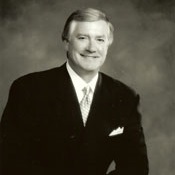 In 1981 he founded Consolidated Planning, Inc. The firm has been named to the Inc. 500 "Fastest Growing Privately Held Firms" in 1988 & 1989, has received the "Master Agency Award" (Top 100 firms in the country) for 22 consecutive years (since 1988) and has received The Guardian's highest award, the "President's Cup", 5 times. Rick has been involved in both the community and the industry having served as Chairman of the Charlotte Better Business Bureau, Past President of the Charlotte GAMA, former board member of the GAMA Foundation, and past Chairman of The Guardian's Field Advisory Board. Rick is currently serving on the UNC Charlotte Foundation's Board. Rick and his wife, La Donna, currently reside in Charlotte, where they are members of Myers Park Presbyterian Church.